When Frank Sinatra enticed leisure travelers to “fly away” to exotic locales, charming Puerto Vallarta, Mexico, began to gain fame for its beautiful coastline and temperate climate. As the film location of the 1964 blockbuster “The Night of the Iguana” and a private getaway for Elizabeth Taylor and Richard Burton in the 1960s, the beach destination attracted even more tourists to its sandy shores. What has turned the sleepy Mexican seaport into a bustling tourist attraction has also created a convenient convention destination for business visitors from around the world. “You may travel somewhere else, but the drawing place, the magnet, is Puerto Vallarta,” stated Rolando Miravete, director general and managing director, Puerto Vallarta CVB. Only minutes from the Puerto Vallarta International Airport, the eco-adventure driven destination offers a picturesque boardwalk called Malecon, over 360 restaurants and 22,000 hotel rooms, only second behind Cancun. In addition, the seaport city ranks sixth in airlift in the country, can be reached within a three-hour flight from most of the continental U.S. and was awarded TripAdvisor’s 2014 Travelers’ Choice as a Top 10 Destination in Mexico. 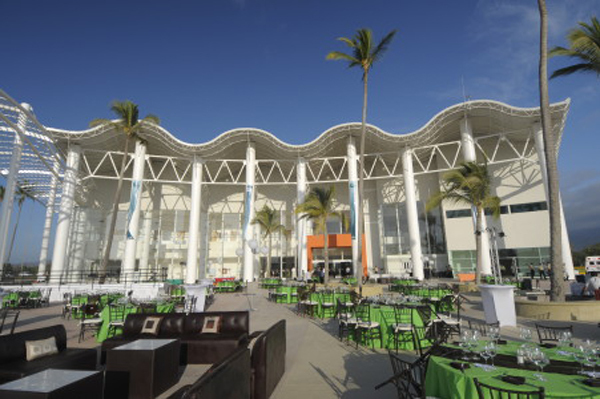 Keeping in theme with the resort destination, the architecture of Puerto Vallarta International Convention Center was constructed in the shape of a seashell. Opened in 2009, the 161,500 square-foot facility has already been rated by among the top three destination management companies. It is the only building in the world that maintains the 320-acre natural protected area within which it was built. The surrounding gardens, called Estero El Salado, contain three mangrove species, 20 species of mammals, 30 species of amphibians and reptiles, and 100 species of birds, including a pet hawk named Harry adopted by the facility. To preserve the biological balance and service nearby Banderas Bay, all profits from the Puerto Vallarta International Convention Center are invested into the preservation of Estero El Salado. Completely self-sufficient, the state-owned facility receives no funding from the Government of the State of Jalisco or bed tax from Puerto Vallarta’s hotel zone, where most of its delegates stay during conventions. As a tourist destination, convention business is a novel concept for the coastal town of Puerto Vallarta. Officials at the convention center are working to prove the value of hosting large events at its facility rather than in hotel conference and event centers. Barlow, who was awarded Chairperson’s Award 2013 at International Association of Exhibitions and Events’ Expo! Expo! in December 2013, has worked as director general of Mexico City’s Centro Banamex. Her experience and expertise as a former show organizer and director of the largest business center in Mexico helped bring international conventions to Puerto Vallarta, including the World Economic Forum, World Immigration Congress and the Heavy Oil Latin America Conference & Exhibition, which was hosted on the Pacific Coast for the first time in 2013. Establishing the infrastructure of the Puerto Vallarta International Convention Center was no easy feat when faced with fierce competition from other destinations, according to Barlow. As a centralized economy, the industry functions around Mexico City, where major Mexican tradeshows are held. Unlike other parts of the world, Mexico must bring its market to attendees. With consumer tradeshows serving as its largest growing segment, most convention business is concentrated in Mexico City. Another difficulty was staffing the facility with experienced workers in a city that had never had a convention center before. By partnering with industry associations and organizations, Barlow was able to train and lead certified meeting professionals. Finding its niche in corporate meetings and corporate sales groups, the convention center can hold up to 5,200 delegates. With its multi-purpose, column-free, fully carpeted exhibit hall and flexible meeting spaces, the two-level facility can hold an event that is part tradeshow and part breakout rooms for 1,200 or conventions and congresses for up to 2,800. Its outdoor plaza, adjacent to the Estero El Salado natural protected area, has hosted up to 2,000 guests for fairs and tradeshows. Working closely with its neighboring state of Nayarit since October 2013, Puerto Vallarta has been able to drive more convention business to its destination. Depending on the same airport, marketing efforts for tourism in Puerto Vallarta and Nayarit were redundant, according to Rolando Miravete. Offered a larger marketing budget for a joint venture by the tourism board, the two destinations now promote their diverse offerings together. Since Nayarit does not have its own convention center, its visitors conduct business in Puerto Vallarta while Puerto Vallarta visitors benefit from upscale travel and wedding planning in Nayarit. Gala Vallarta-Nayarit, an annual tradeshow for the tourism industry, has since alternated locations between Puerto Vallarta and Nayarit. Held April 2-5, 2014, at Puerto Vallarta International Convention Center, the welcome cocktail took place at the Grupo Vidante Mayan properties in Nayarit with its farewell reception at the Puerto Vallarta Martime Port.